"I want to tell you that I absolutely love your system. Finding the sweet spot was fairly easy and gave me all the wind protection I hoped for. Then I tried the winglets and Wow, what a great accessory! Everything even clears the huge Highway Dirt Bike handguards, which I did not think any windshield would be able to do. Wonderful! I am very pleased with both your product and customer service and I won't be afraid to tell others!" 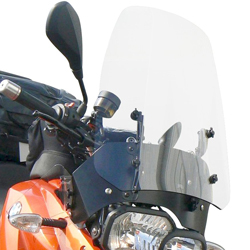 The removeable Lower Deflectors or 'Winglets' divert the wind that comes in on each side of the headlights and hits your body from underneath, giving you smooth riding comfort beyond what any windshield can do, and a larger pocket of protection to extend your cold riding season. !quote, screens, 08, 09, 10, 11, 12, 13, 14, 15, 16, 17, 18, 19, 20, 2008, 2009, 2010, 2011, 2012, 2013, 2014, 2015, 2016, 2017, 2018, 2019, 2020!